All presentations will be presented in POSTER style. The detailed requirements and formats of the poster presentation are in preparation. 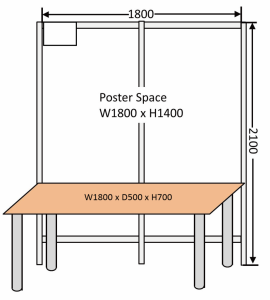 The space for a poster presentation is a board (180cm in width, and 210cm in height) with a desk (180cm in width, 50cm in depth, and 70cm in height) in front of the board. Pushpins are available to display a poster on the board, which are prepared in the presentation hall. Each session has 90 minutes for presentation. It is divided into the first and second time slots (45 minutes for each). Each poster presentation is assigned to a time slot as a core time, when presenters must explain their posters. The first half for the odd-number presentation and the second half for the even-number one. Presenters have to arrange their poster presentations (display of their posters and arrangement of their devices at the allocated space for poster presentations) in 30 minutes between the sessions. Presenters have to remove their posters at the end of the session. Posters left on the board 20 minutes after the session may be removed by staffs. A table and a power supply (100V, 1 plug) are available for each presentation. Presenters should prepare extra plugs and cable extensions by themselves if necessary. Note that the total power capacity of each group of spaces for poster presentations is limited to 1000W. Please ask officials if you need large amount of power. Officials may stop demonstrations when they disturb other presentations by loud noises or dangerous situations. Any posters, devices, or laptops should not be sent to the conference venue in advance.